I'm probably about a 5. My living room bears the brunt of the decorating; I've never gotten into decorating the rest of the house. I haven't even started yet. I used to have to wait until after football season, which ended the first weekend of December. I'm sure I'll get around to it at some point. My decorations stay up until Epiphany, but I found out that they can stay up until the Baptism of Jesus...so, YAY! The tree can stay up a few more days than it usually does! I have one that I put on the front hallway table; it's not really special, just one that I picked up at Belk after Christmas. We don't live in a subdivision, but we did in SC...and Ga. We have great neighbors, but we definitely don't socialize with them like we did in our other houses. Not really. It's just another day. I love Christmas Cacti; they remind me of my mom. I received one last year from a student, and it started blooming. 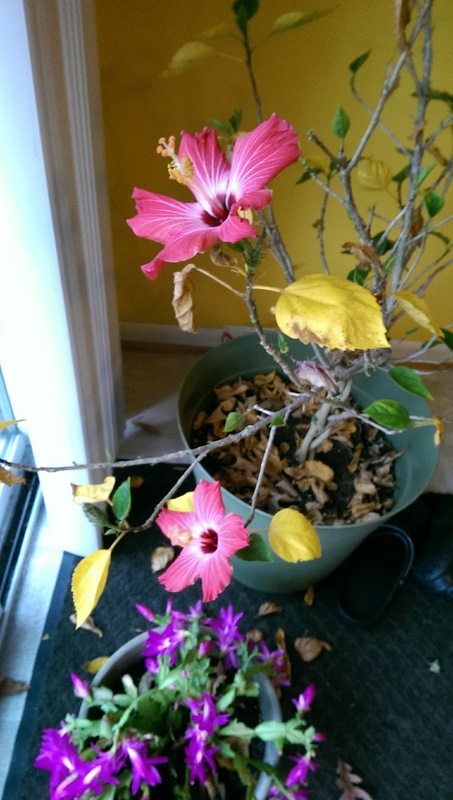 Something must be going right, because, even though my hibiscus looks like it's not doing well, it's blooming...something it didn't do this summer when I repotted it. I made my first batch of Texas Millionaires on Sunday to give away as a gift. I don't know how much baking I'll actually do this year...it seems every year I tone it down a bit. Hopefully I'll get more in the spirit by the time break rolls around. It just doesn't seem like the holidays...too much going on in this part of the country! I LOVE "The Holiday". One of my favorites I forgot to mention. Also love "While You Were Sleeping" and "Sleepless In Seattle"...we call them Christmas movies too! A fun Hodgepodge! I enjoyed reading your answers! I love The Holiday! One of my faves. Yes, there is so much heartbreak in your part of the country right now. It's nice to see people rally and give generously in help and support. We'll be in the mtns. for part of the Christmas holiday. Hubs parents celebrate their 60th wedding anniversary tomorrow, and I think will be in the paper so look for them. We'll celebrate as a family when all their kids can be together over Christmas. I never like taking the tree down on Epiphany because that's my birthday. It's depressing enough without having to take down Christmas, too. LOL Are the fires out yet? I don't watch the news if I can help it. What are these Texas Millionaires? 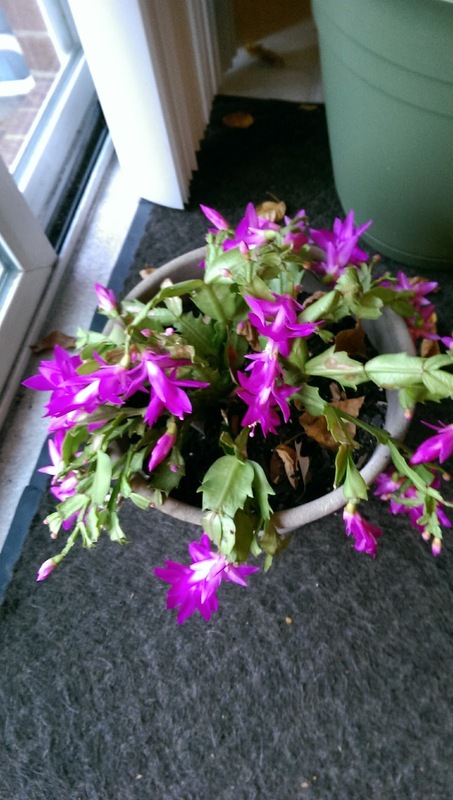 I had a Christmas cactus for about 4 years before finally killing it. I loved that thing but refuse to risk it again. Have a wonderful Wednesday! My cactus is blooming like yours! Enjoyed reading your answers. I hope to finish up on my decorating by Sunday. Then it is out of town gifts and cards next. After that will be baking. I do love it all but it gets harder each year. Merry Christmas to you and your family. Never heard of a dish called Texas Millionaires. We have met a few though. You can't tell it by looking at them or talking to them. Praying for those in the fire area. What date is the Baptism of Jesus? I often keep our tree up at least until the Day of Epiphany. One year, I just left it up all year long. :) It wasn't hurting anything and wasn't in the way, so I figured it didn't matter. How close are they to having all those fires contained, Mary? I saw in our hometown newspaper (Anderson Independent-Mail, Anderson SC) that two teens were charged with setting the Gatlinburg fires. I wasn't able to access the article because of a glitch (hopefully corrected by now! ), so I don't know anymore than that. I am praying for all of you over there in God's Country and for the fires to be out soon if not already and for the area to heal and be as beautiful as ever. Have a blessed weekend and a Merry Christmas!